Lists are such an important part of our culture. We make lists not only for our off-day chores and travel bags, but for information we need to know and goals we want to achieve. For this reason, I begin this 20-part series on lists that matter to me as a writer and teacher. They might also matter to you if you read WORD ON THE LINE in your continued development as a writer. In these lists, I mention sources for your review, but hyperlinks occasionally become obsolete, and you might find even better sources than these I recommend. So happy researching. I begin the series with instructive and inspirational interviews of five established authors. I like the way James Baldwin stands up to William F. Buckley in this famous 1965 political debate. I share it not so much to draw attention to Baldwin's literary powers but to shed light on the author's ethical obligation. Harold Bloom, the legendary critic, holds court in a humorous, insightful interview about reading and literature at the ripe age of 81. Novelist and essayist Joan Didion speaks about her two most recent nonfiction books and her approach to writing. Game-changing British playwright and Nobel laureate Harold Pinter talks about his writing process in the first half of his Nobel lecture; you can skip the back half if you don't like his politics. Sam Shepard, the Pulitzer Prize-winning playwright and actor, talks about a broad range of topics, including how we invent myths of ourselves. 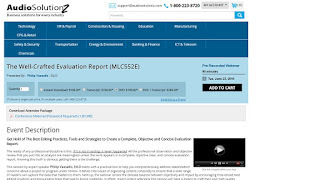 The Well-Crafted Evaluation Report, one of my most recent webinars offered through Audio Solutionz, is available for purchase. It examines planning, status, and completion reports on programs and projects from a wide range of industries. My Audio Solutions webinars are convenient and inexpensive ways to capture key information needed for improving work-related writing skills. Writing High-Impact Executive Summaries, one of my 90-minute evergreen webinars, is available for purchase through Audio Solutionz, an online global educational consulting service. 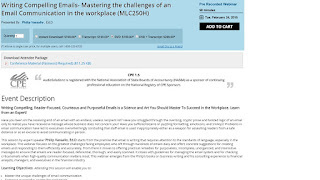 This webinar covers one of the most challenging types of work-related writing: the executive summary, which requires communicating detailed and complex information on the highest possible level. It offers 12 broad tips across 4 specific business-writing domains. 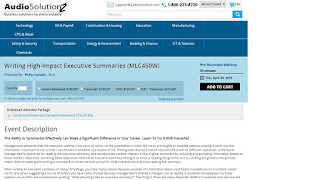 You will find the examples and suggestions immediately useful in writing executive summaries of your own. 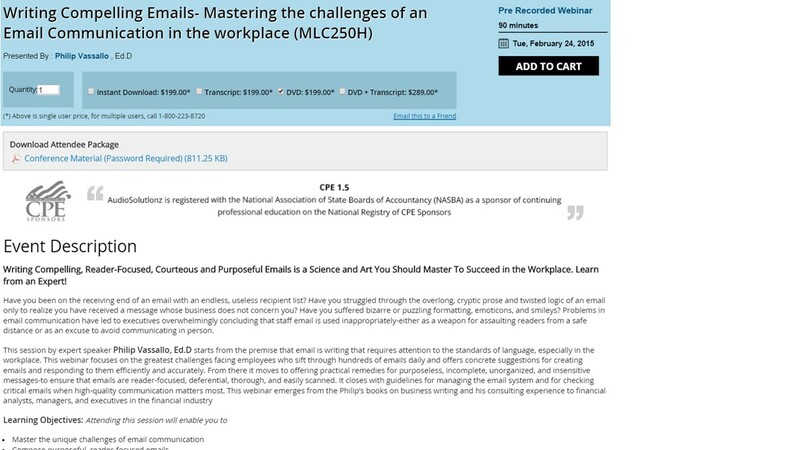 Writing Compelling Emails, one of my most popular webinars, is for sale at Audio Solutionz, a well-established online education firm serving diverse industries globally. This webinar looks at writing audience-focused emails that get to the point while respecting the conventions of complete, courteous, clear, concise, and correct communication. It also offers tips for using the special features of email, such as reply all, attachments, forwarding, and blind copying. This webinar is indispensable for companies that want to create email standards for all employees to follow.